A continuous fill vapor steam cleaner for non stop cleaning! 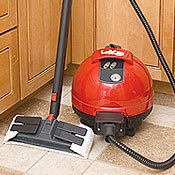 The Ladybug steam cleaner achieves our five star rating and is one of our best selling machines for good reason. By cleaning your home with steam vapor you not only leave the home sparkling like never before but you also significantly improve the air quality. The Ladybug 2200S steam cleaner is a versatile machine which includes a full accessory kit to deep clean and sanitize almost any surface in your home or apartment. If you want a superb quality machine, this steam cleaner will not let you down. The LadyBug is nicely balanced, compact and easy to carry and move around. There is an optional canvas bag which nicely holds all of the accessories in one place.Now for the exceptional cleaning results!Because the Ladybug 2200S runs hotter than most steam cleaners and has better tools, its ability to clean is thoroughly very impressive. Here are some of the problems we have tackled and been very satisfied with the results. Using the nozzle brush to get rid of semi- hidden dirt around the kitchen sink is a revelation. The Ladybug 2200S’s ease of use, continuous fill, safety features, quality of tools, and overall quality of the machine make it a true winner. We had to think very hard to come up with any minuses for the LadyBug. The 2200S takes your money a long way since it will deep clean and sanitize almost any surface in your home in one easy-to-use machine. With the Ladybug one can kill dust mites and bed bugs, deep clean tile floors and grout or even spruce up the interior of the car. Simply put, the cleaning applications are endless! Plus you will never need to purchase multiple household cleaners, mops, buckets and paper towels again. This is the favorite appliance of the clean freaks, and you know if you are one of them!